List ways data is used to support business objectives. List ways to measure data quality. Install the Data Quality Analysis Dashboards App and interpret the dashboards. You respond the way a real superhero does: You head back to your desk and run a few reports. Unfortunately, the reports are about as useful in explaining your data problems as the video of a cat on a Roomba that you’re currently obsessed with. You realize you have no clue how to assess the quality of your company’s data. Blank fields? Duplicates? Incorrect information? Where do you even start?! Then you remember something you read: The first step in assessing data quality is to figure out how your company uses customer data to support its business objectives. Sounds like a good start. What customer data is required to support those objectives? How are you using that customer data? Where is your customer data stored? It turns out that while each department has a unique set of objectives, many departments are using the same customer data. Unfortunately, each seems to have its own process for creating and maintaining that data. For example, nearly all departments need customer contact info. But each department uses its own source of truth for that contact info. Sales uses Salesforce, Accounting has an intricate system of spreadsheets, and Customer Support barely has any system at all. Same story with all kinds of data across the company. You try your best to find two departments that use the same process for creating records. But you’d have more luck finding a vegetarian at a pig roast. You check with several sales managers. One tells you that her team keeps all their customer info in a shared spreadsheet. At the end of every month, her assistant transfers the info to Salesforce. That is, until her assistant quit 3 months ago. Another sales manager told his team not to worry about entering the data into Salesforce (even though it’s company policy!). With data practices like these, it’s no wonder your reports are riddled with duplicates, incomplete records, and stale data. It turns out that the data genie doesn’t just appear and grant you three wishes. If you don’t have company resources devoted to data quality, chances are your data can be better. You organize all your findings in a handy reference table. Knowing how your company uses data to support its objectives is great. But it’s about as useful as a VHS tape in a Roku if you can’t get the data into an accessible and useful format (that is, into Salesforce!). “What’s wrong with the data we do have?” the director of sales asked you. The proof is in the pudding, right? The best way to assess data quality is to look at the data (or lack thereof). Every department in Gelato was tasked with using Salesforce as the source of truth for data. After talking with managers and reps across departments, you know that’s true. But the best way to prove your point is to review the data in Salesforce. 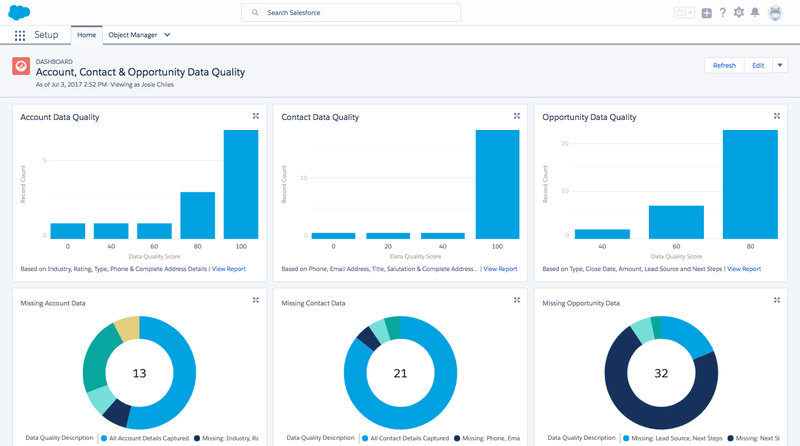 Once the execs see the data gaps in Salesforce, they’re sure to prioritize data quality. So, if the proof is really in the pudding, just how do you make the pudding? Age Data doesn’t age like fine wine. What was the last time each record was updated? Run a report on the Last Modified Date of records. What percentage of records have been updated recently? Completeness Peanut butter without the jelly? No way! Similarly, you can’t find upsell opportunities without complete company hierarchy and industry information. Are all key business fields on records filled in? List the fields required for each business use. Then run a report that shows the percentage of blanks for these fields. You can also use a data quality app from AppExchange. Accuracy You don’t win Olympic gold for missing the target. Is your data as accurate as possible? Has it been matched against a trusted source? Install a data quality app from AppExchange. It can match your records against a trusted source and tell you how your data can be improved. Consistency Is the same formatting, spelling, and language used across records? Run a report to show the values used for date, currency, state, country, and region fields. How many variations are used for a single value? Duplication Sometimes two isn’t better than one. Duplicate data often means inefficiencies. Are records and data duplicated in your org? Use the Duplicate Management features in Salesforce and install a duplicate detection app from AppExchange. Usage Use it or lose it! Is your data being harnessed in reports, dashboards, and apps? Review the available tools and resources your business uses. Are you optimizing data use? Thinking about all the work needed to generate these reports is giving you a headache. You’re about to slurp down your third Frappuccino of the day when you happen upon Salesforce AppExchange. Turns out there’s a smorgasbord of packages that assess the quality of your data across various dimensions. In just a few clicks, you have access to a host of reports and dashboards. One AppExchange package you really like is the Data Quality Analysis Dashboards App. For more useful AppExchange packages, review the resources section. Here are the steps for installing the Data Quality Analysis Dashboards App from AppExchange. For detailed instructions, check out the Application Installation Guide. On the Data Quality Analysis Dashboards App page, click Get It Now. The wizard guides you through the installation steps. In your Salesforce org, from the app menu, click Dashboards. To see all the dashboards in the package, click All Dashboards. According to the dashboards, Gelato’s data is in fairly good shape but can still use some TLC. Let’s dig deeper into Gelato’s opportunity data. 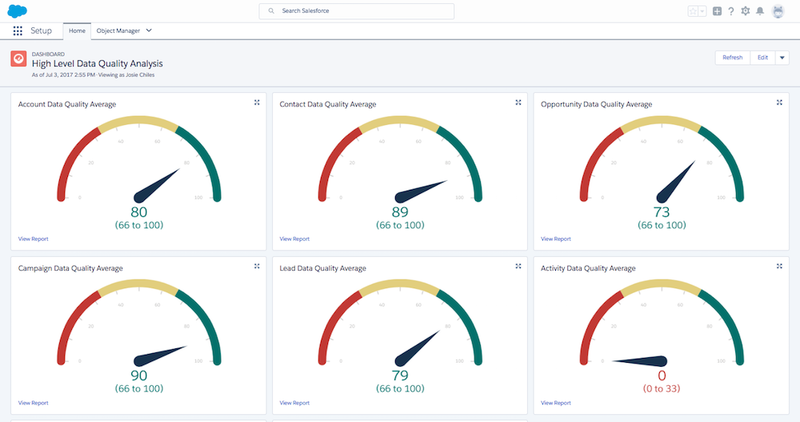 In the Account, Contact & Opportunity Data Quality Dashboard, you can see that many opportunities are missing key business fields, including lead source and next steps. Remember that you already identified that data as crucial to supporting Gelato’s business objectives, so it’s a priority for Gelato’s sales teams to update those fields. You share the results with the director of sales. She’s clearly impressed and is convinced it’s important for Gelato to improve its data quality. My job is done here, you think, as you turn on your heels and begin to skip back to your desk. Not so fast, hotshot. She’s putting someone in charge of improving data quality. Guess who? That’s right—it’s up to you to figure out how to improve Gelato’s data quality. Check out the next unit to see how you pull it off!